Thanks for all the info and especially the reminders/recommendations at the end of your e-mail. They will be with me when I shop! Again, thank all of you for my lovely new living room! - Catherine Matta"
A "before picture". 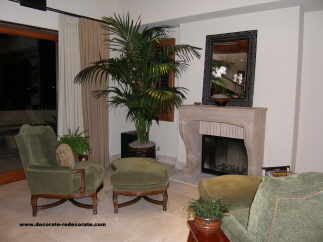 Jan and Jerry's former designer placed these two chaise lounge chairs with their backs to the fireplace, trying to force them to "join" the rest of the great room. It didn't work and Jan and Jerry didn't know why until they hired me to come and arrange their furniture properly. Believe me, not every arrangement you see in fancy decorating books or magazines is good design. And you have to recognize that sometimes furniture and accessories are positioned in places just to make the angle of the picture look better, when in reality the room would not be used that way in every day life. An "after picture". A simple adjustment in the position of the chaises and the addition of a few key accessories turned the situation around in a matter of minutes. Sometimes even full service interior designers lose sight of good placement concepts in their zeal to push their private agenda rather than making the space work for the client. Jan was so impressed by my solutions and the reasonable rate for my services, she immediately referred another couple with a multi-million dollar home whom I redesigned two weeks later. I Have the Solutions for You - If you live within 30-45 minutes of Huntington Beach, CA, and want a private in-home consultation with me, you have only to ask. I will set an appointment with you at a mutually convenient time, come to your home, ascertain your needs, survey the situation, and when it comes to rearranging furniture, there is no one better. I know that sounds very arrogant, but I've just been doing this for so long, and it is my specialty, that I just haven't run into a room dilemma I can't solve. So pardon me tooting my own horn so blatantly. I have tackled extremely difficult situations and have been able to successfully resolve the dilemma in less than one day - most rooms take 2-3 hours, depending on difficulty and number of furnishings needed to complete the project. Redesign is not merely a moving of furniture and accessories. It takes careful analysis of the room's architecture, the family's usage of the room, the nature of the furniture and accessories. It includes a lengthy process of evaluation and shopping the home for other items that might be incorporated into the design. My goals are always to work solely with what you already own, but there is often a need for you to shop later to add to the design for a really finished and professional look. I work very hard to make sure you are 100% satisfied with the rearrangement given to your room, or you will not be charged until or unless you are delighted. So there is no risk to you to have me come and give you the benefit of my 30 years in creative design. I promise to use what you already own and will never, ever come in and judge your home or your possessions. You will never hear me tell you it all has to go, though I may suggest a piece or two be moved to another room or discarded if it is really in poor condition. But then you won't need me to tell you that - you'll already know. 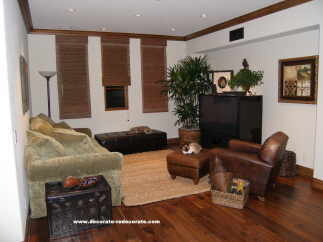 "Barbara has redone my family room and living room. Incredible work . . . what a talent . . . Rooms look more spacious with an artistic taste to fine design. Great personality and works with home owners in a friendly fashion. I love her and I love her work and I'll recommend her work to anyone who wants great taste. 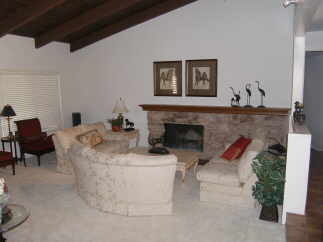 - Nardine, Riverside, CA"
"I am extremely happy with the redecoration of my living room. Due to it's odd set-up, it was very difficult to arrange the furniture to make the room look appealing and put together. Now, not only is it appealing and put together, it is perfect to entertain as well as make the most of the features of the room. Barbara and her assistant were wonderful to work with and they worked with my style rather than try to make me conform. Thank you. - DK, Laguna Niguel, CA"
Should you need additional furnishings, I will make recommendations on what to get and where to put it, what size and shape and color and pattern it should be and answer any other questions you might have. But shopping for those items is left completely up to the you. Cate and Gary Matta had a living room that needed some pizazz. Decorating almost exclusively in neutral colors, their biggest problem was the arrangement. Due to Gary's health problems, he needed an extra wide traffic lane to maneuver properly in the home. With 3 entrances to the room, this created a problem that they could not resolve. This is the way the room looked when I arrived. I'm in the business of solving decorating problems. A couple of hours later, the room was completely rearranged into a cozy, functional space that allowed them to watch TV and enjoy a fire in winter, keep extra wide traffic lanes, display Catherine's fine crystal collection and antique desk, and still have lots of room left for the addition of plants, a console table back of the sofa and a coffee table and area rug. Cate and Gary are delighted with the transformation, especially since Gary suffers from a disease which makes walking difficult and he needed extra wide traffic lanes so he didn't have to turn sideways to move about the room. "You make it look so easy! ", exclaimed Catherine. Well, it is relatively easy when you know what is ineffective and you know the basic design concepts needed to correct the problems. As you can see by the transformation above and on the other pages, selecting the right location for your furniture and accessories is critical to the final outcome. It is amazing to me, however, that of all of the concepts taught in interior design classes, this one very important phase is often virtually unaddressed. So it's no wonder that the average person hasn't got a clue as to how to make their home or room look the way they dreamed it could look. While a huge number of people love the idea of learning what to do and how to do it and why it should be done a certain way, I understand that there are a whole other segment of people who just don't have the time or the interest to learn what to do on their own. For them it makes perfect sense to hire someone like me to come in and quickly and easily solve their arrangement problems so they can concentrate on matter they feel are more important to them. Jan and Jerry built a multi-million dollar home in Naples, Long Beach. Frustrated with the interior designer they had hired, they sought help from a local college's interior design department. After being quoted $40,000 by a student to come and arrange their furniture and accessories, they found mej on the internet. I completed their great room (living room, nook, dining room and kitchen), a guest bedroom, this TV room, a porch and the entry for $750.00 The client was so thrilled by my willingness to stay longer than the allotted time, giving her a chance to purchase some plants to be added, she bonused me by an additional $250.00. It is so thrilling to make people this happy. I have been hired to return to complete all of the bedrooms. Jerry had been planning on removing the giant screen TV from this room because he was unhappy with the way the room looked. After I did some simple arrangement solutions, he decided to keep the TV, saving himself several thousand dollars in the process. Neat! Redesign is not expensive at all when you consider the cost in unnecessary replacement of furnishings that you just don't like because they are merely in the wrong place or the surrounding space just doesn't feature them correctly. How do you put a price tag on enjoyment? On peace of mind? On making a room more functional? These are sometimes intangible qualities. The problems exist everywhere. The solution is placement. You'll be amazed at how I can transform your rooms in the blink of an eye, and how you'll fall in love with your furnishings all over again. First, if you want to resolve your decorating dilemma in the shortest possible time frame, with the least amount of interruption to your daily life, then you should consider my fee-based redesign service. There is an initial form to fill out and submit. When I receive the form data, I will contact you by email. Once I have discussed your wants and needs by email, if we mutually feel that I can help you, I will arrange an appointment to come to your home prepared to jump in and do the following: discuss the room's usage with you and your family lifestyle, take some quick video and still pictures of your room for our records, take full measurements of your room and furnishings, assess your room's architectural features and how best to arrange what you have to make the room highly functional and beautiful to the eye, "shop" your home for other furniture and accessories not presently in the room that might be incorporated into a final arrangement concept, create an arrangement re-design (arrangement makeover) for your room that is based on how you and your family use the room and the natural points we would want to highlight, and then begin the process of layering in the actual furniture and accessories that are best suited to bring complete functionality and beauty to the room. Yes, I promise to turn the room (as closely as possible) into a "designer showcase" using what you have already got to it's best advantage - no matter what you have or what condition it is in. So what is that worth to you? Probably a lot. But actually my fees are very affordable. A half day redesign appointment is normally $500 but by requesting your appointment over the internet, I have discounted the fee to $450 (4 hours including travel). My all day fee is normally $800 but by requesting your appointment over the internet, I have discounted the fee to $700 (7-8 hours including transportation). If you are out of the area, I only do full day redesign appointments for not less than $850 depending on distance and your circumstances. The fee is due and payable immediately upon completion of the redesign service. We accept only cash or money orders at the redesign appointment. Yes, my work is 100% satisfaction guaranteed while I am at your home. If you are not happy at any point during the process, you merely need to tell me and I'll make adjustments to the concept while I am there in your home. I will stay there until you are pleased with the results as it is my deep wish to always leave my clients satisfied and happy. So please feel free to discuss your feelings with me at any time during the redesign process. This is very important. Only members of the family may be present during the redesign process. We ask that you don't invite friends, relatives, neighbors or other acquaintances to your home while the transformation takes place. The distraction only serves to slow us down in what we can accomplish for you and while we are more than happy to teach you the design concepts we use for proper arrangement of your furnishings, this is not to be viewed as an opportunity for a free seminar on design for others. We thank you for your understanding and your cooperation in this matter. I am extremely busy, so I only accept clients that are within a 30-45 minute drive of me normally, so if you live outside that time frame, consider utilizing my Consultations by Mail program described here or contacting me to see if my schedule will accommodate any additional distance. Distance redesign requests will be evaluated on a case by case basis. I will be happy to discuss your situation with you by phone during normal business hours, Monday-Friday, 9:00-5:00 PST. If you get my automated voice mail, it means I'm either with a client or doing a redesign at someone's home, which may be an all day project. Please leave a detailed message with your email address and I'll try to advise you on what's best for you or simply fill out the form below and I'll be in touch. "This was even more fun and helpful than I expected. Barbara was warm and friendly and, best of all, I didn't feel like I had to agree with everything she said. The house looks so much more full and finished. I would recommend this service to anyone - and will! - Bette Hagerty"
"Barbara Jennings came to the house and created an atmosphere that's cozy and welcoming. She took knick knack that I did not consider worth displaying and enhanced the look of the groupings of furniture. The paintings that are so valuable to me and my family were displayed in very prominent places that gave importance to the art reinforcing our family connection to them. I appreciate the transformation and the pulling together of all the pieces of furniture that used to be stuck in places they do not belong. Many thanks. - Aida Resurrecion"
"Hi Barbara, Thanking you doesn't seem enough. I can't tell you how my mood, in my own apartment, has changed. I love going from room to room and just looking. I can actually keep the blinds open if I want to. I can't believe it's my own apartment! Slowly, but surely I'll have all your suggestions in place. . . . Thank you for teaching me . . . I really enjoyed working with you and Dave on Saturday!! Thank you so much! 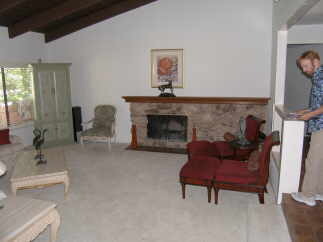 Elena Beacom"
Lisa from Agora Hills in California contacted me for help with her living room. Her husband is a superior court judge and they entertain often. But she was embarrassed about her living room. A very charming gal, Lisa displayed the perfect attitude throughout the entire process. She literally gave me a free reign to do whatever I thought was best, giving input along the way and even jumping in to help with the pushing and pulling of furniture pieces. She was a joy to have as a client and I can't say enough good things about her. She listened intently to all the training I was giving her as we went along and had the most enjoyable sense of humor too. Lisa's living room was suffering from a very common problem we refer to as "screaming distance". On top of that, she had a 3-piece sectional, an asymmetrically placed fireplace and steps into the room that cut down on some critical floor space. Some of the furniture had been hers when she was single, some had belonged to her husband when he was single and some had been inherited. I have to admit, it was one of the most difficult rooms to arrange I have faced, but when we were done, she and her husband were thrilled. I have to say I was very pleased myself. TESTIMONIALS Lisa wrote: "Very positive experience. I appreciated the non-judgmental approach to assessing the problems and the way in which I was involved in creating a new ambiance. I never, in a hundred years, would have come up with the arrangements. I am so pleased, I can't tell you. I love my new living room." And Judge Mike wrote: "Fantastic experience; made an un-living room, a personal place to greet and entertain." "How can I possibly put into words how much I appreciate all that you have done for me? 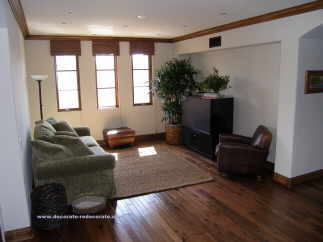 When this house sells, I know it will be in large part to your expertise in staging. The atmosphere you created here is what is going to cause someone to fall in love with this place enough to want to move in. - Sandy Cox." I'll arrive (with or without an assistant) and take some preliminary video of the rooms and some still pictures. Then I'll talk with you about your lifestyle, preferences, goals, room usage, family, etc. Then we'll do a walk through to "shop your home" for furniture or accessories I might be able to use if needed. You can tell me at that time what you're willing to let go of and what you absolutely can't live without. While we're doing that, my assistant(s) will be measuring the rooms and furniture and drawing a floor plan for me to use later. Then I'll be ready to tackle your priority room and rearrange it for you. I'll try to teach you what I'm doing and why as I go along. If you are selecting a full day redesign, I will proceed to the secondary priority room as time permits and so on until the day ends. Please bear in mind that I may find some areas that need little to no improvement and other areas that may require extensive changes. It varies for everyone. If I make some drastic changes, you and your family will have some adjustments to make emotionally and mentally and should be prepared to accept change. Some people have more trouble dealing with "change" than others. Before your scheduled redesign, please review your furnishings so that you have a good idea of what you're willing to let go of and what you definitely want to keep so I can make the space as functional and beautiful for you as possible. At the end of the half-day or full-day redesign, we grab some "after" video and still pictures. Later I use all this data to see if I can come up with some additional ideas to send you. I can't guarantee anything, but I always try. Please know that I want your input as we go along. If I am doing anything that you just plain dislike, you need to tell me. Don't worry about hurting my feelings. You won't. I need your feedback to ensure I'm moving in a direction that pleases you. 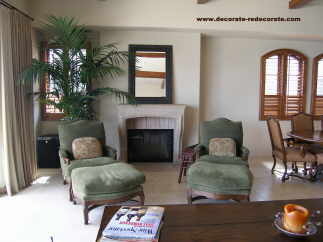 At the end of the redesign, I will ask for payment in cash or a money order payable to Decorate-Redecorate.Com. No personal checks, please. I will also ask you for a brief testimonial - just let me know in writing about your feelings (good or bad) regarding the redesign experience. I trust you'll find it very easy to rave about your home's transformation. Getting started is as easy as filling out the brief form below and submitting it. What brought you to Decorate-Redecorate? Please tell us the name of the referring entity. Tell us about your room? Overall size, architectural features, etc. and what you feel your major problems are. just enough or describe another scenario. TERMS AND LIABILITY RELEASE: Please copy and paste the following paragraph into the box below it and add your name to show that you have read the terms, understand them and agree to them. Your privacy is very important to us. We will not give or sell your name and information to anyone.Click the button above to respond to Submit. Forms capable browser required -- Just Press the button ONCE! If you make a mistake, just click on the "Clear Form" button and re-enter your information.